How do you, the home sewer, achieve that perfect rolled hem? With a rolled hem presser foot! Read on, and I’ll show you how to create ready-to-wear-worthy hems on your home sewing machine using a presser foot! A narrow rolled hem that is even and smooth is a sure sign of a well-made project. For the home sewer, however, achieving that standard can sometimes be a challenge. Especially when working with lightweight and delicate fabrics that are not only difficult to handle but also tend to shift about and fray excessively. 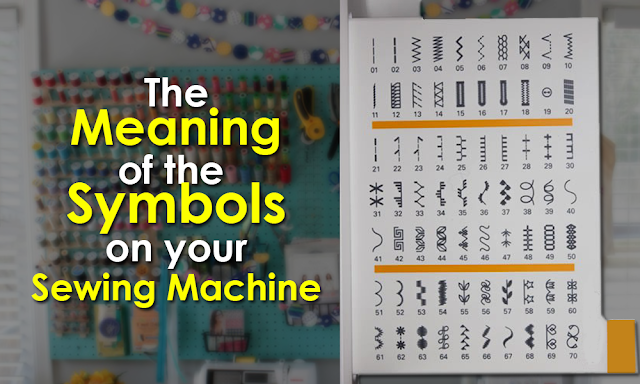 There are a variety of techniques and numerous tutorials on how to sew narrow rolled hems using conventional presser feet, but they all require a good eye, a super steady hand and precise measuring to turn and produce a hem that looks professionally done. A simple alternative is to use a rolled hem presser foot. 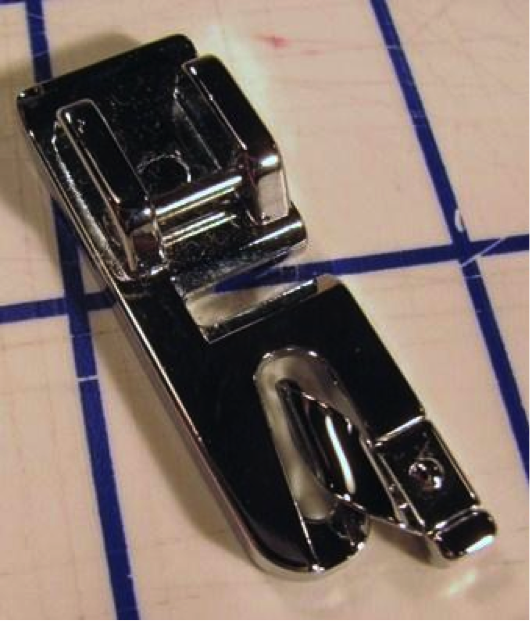 This widely available device comes in a variety of sizes that produce varying hem widths. While they can be used for any type of fabric they are a good choice for hemmings sheer and very lightweight fabrics such as chiffons and charmeuse as they produce a very fine and elegant finish to any garment. Many of today’s most stylish tops and scarves sport these types of hems. The simple fact is the rolled hem presser foot produces beautiful, narrow hems that are nearly impossible to do as well without one. It is important to note however, they work best on straight hems. So, for scarves, this is the way to go for finishing the edges. For curved hems, which are cut on both the bias and straight of grain like ruffles, feeding the fabric on the straight portions requires greater finesse and can be a bit more challenging. Nevertheless, using the presser foot is relatively easy. The key is getting the fabric to feed correctly into the foot at the start. With some careful attention to stabilizing the first couple of inches of the hem, and maintaining a steady hand at folding and guiding the fabric into the foot evenly as you sew will ensure a beautiful hem. 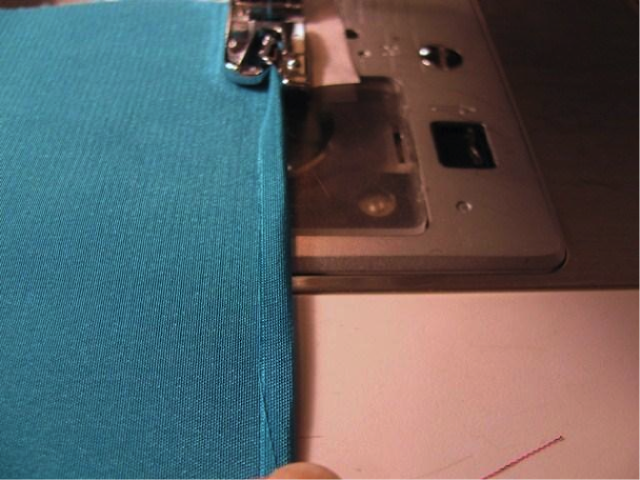 Begin by preparing the first couple of inches of the hem edge. Since this type of hem is typically used on very lightweight fabrics which are difficult to handle, stabilizing the first inch or so with some fusible interfacing will help the edge feed into the foot more easily. 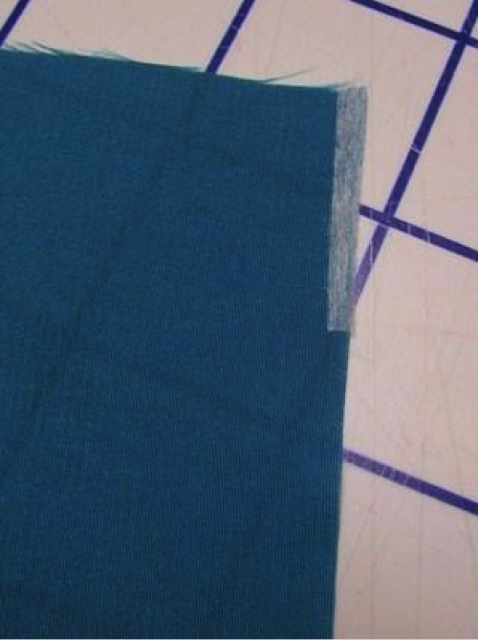 To do this cut a narrow strip of very lightweight or sheer weight fusible interfacing that is anywhere from 1/16” to ⅛” wide (depending on how narrow a hem you want) by 1-2” long . Fuse the strip to the edge of the fabric. 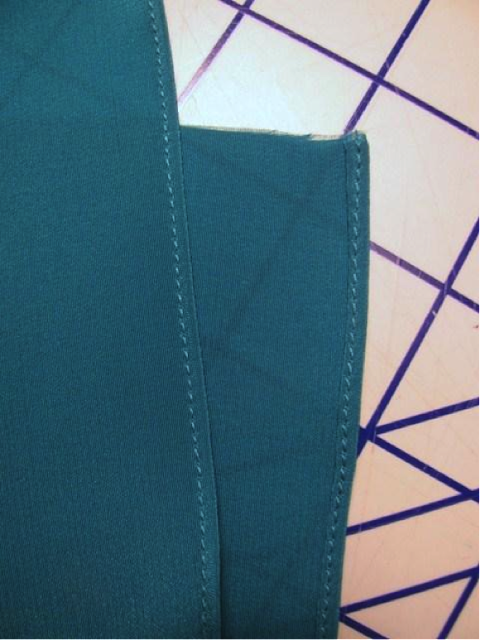 Now fold the hem over by the width of the interfacing strip. Fold over again another equal width and pin in place. Pin the first inch to 2 inches of the hem in place in this way. 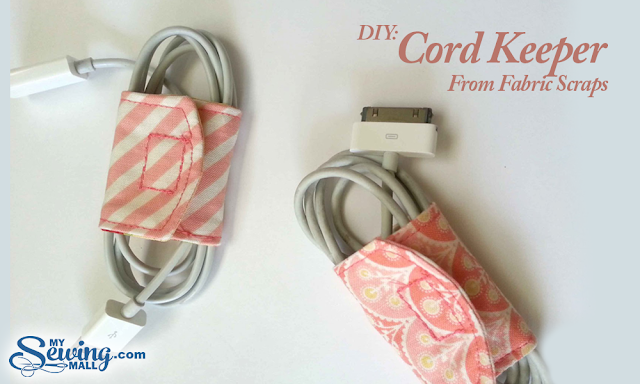 Place a small strip of tissue paper under the presser foot. This will prevent the lightweight fabric from sinking into the throat place when you begin to sew. Now place the pinned hem over the tissue paper and carefully line up the folded outer edge of the rolled hem to the inner edge of the presser foot’s right leg. While gently pulling the thread tails away from the machine, slowly stitch 2-3 stitches into the hem to secure it in place. 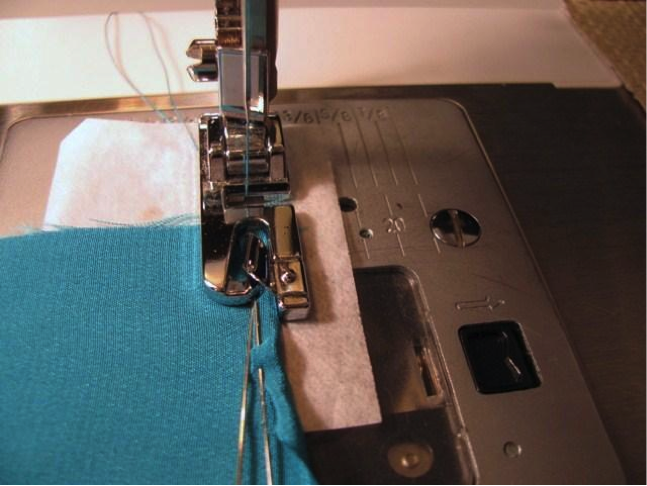 Remove the first pin and with the needle inserted into the fabric, raise the presser foot. Remove the second pin and begin to feed the folded hem into the curled portion of the presser foot. While gently pulling the narrowly folded hem edge towards you, slowly stitch the hem in place, keeping the fold positioned over the curled portion of the presser foot. 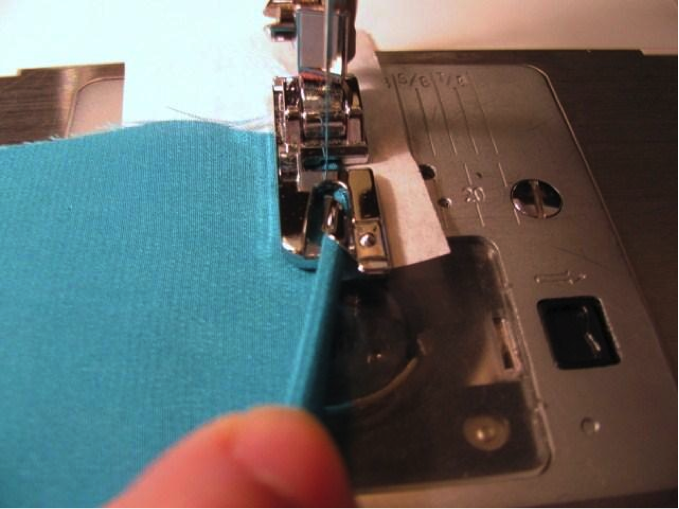 With your hands continue to fold down the edge of the fabric 1/16” to ⅛” as you sew feeding the folded edge into the curled guide as evenly as possible. 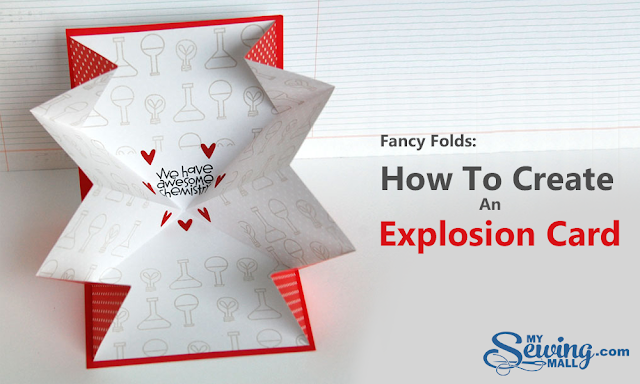 When done, simply tear away the tissue paper and press.